Today we want to help you with shopping for a great swimming watch as it is more and more popular to add swimming to your sports activities and it only makes sense if you watch your improvement and measure your performance in the pool. 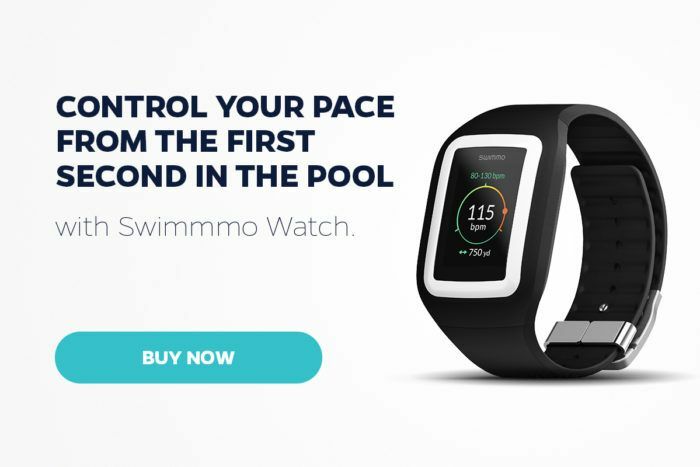 Swimmo is a newcomer on the swim watches market and it came with a bang getting over 180 000 dollars from Kickstarter backers thanks to media buzz and swimmers anticipation eager to try something new. Now it is a mature product with years of experience in building and improving the watch. Swimmo is almost inseparable from its mobile application (Android, iOS) and hands over some tasks that are uncomfortable to perform on the watch display to the app where it can be done faster – for example, custom goals creation or even watch settings. Swimmo gives you all the typical metrics you want like pace, duration, laps, distance, calories but adds one more – pulse from your wrist so it doesn’t require an uncomfortable chest strap. But with the help of your app in minutes, you can create all types of workouts setting a goal just for you and syncing it with your watch. This enables of course tracking of the percent of the goal completed that is visualized on the screen but also something they call Smart Goals. Smart Goals are the custom goals that you will be notified about via vibrations on the watch and can give you feedback on your performance during the swim so you can correct it immediately. For example, if you want to stay in the pace you chose for the workout vibrations will communicate if you have to slow down or speed up to achieve the goal. The design of the watch is modern and comparing to competition very nice looking – there’s no need to take it off after the workout. But good design is more than looks and I just want to mention my personal favorite of all the features – Rotate&Tap navigation – this replaces buttons on the watch (there’s none!) with wrist flicks and taps and it is so simple and intuitive that after 5 minutes I wanted all my watches and trackers to have it! The watch has a full-color OLED screen which is best for the indoor pools where it looks great and is very easy to read. The battery is rechargeable and can last around 7 days of typical swimming training. Poolmate HR is the flagship watch for Swimovate line and it is the most expensive of them at 180-200 USD. Swimovate is famous for very affordable simple trackers and this model is their effort to build a more advanced swimming watch. It has all the features that you’d expect from a swim watch as lap counting, pace, calories and duration and what is the main difference is the included chest strap that connects to the watch to measure swimmer’s heart rate. The monochromatic old-school display may be of use when running but in the pool (especially during early morning training sessions) it is a little hard to see what’s displayed on the screen. Its main feature is also a big inconvenience for swimmers who constantly repeat that chest straps are uncomfortable but what’s worse they move around during turns and stop measuring your pulse. The other downside is a lack of any mobile platform support so you can only download your results to the desktop PC. Suunto Ambit3 as all Suunto products strive to build a high-end, expensive product with the great build quality and characteristic…A huuuge form factor that not every man would be ready to wear. 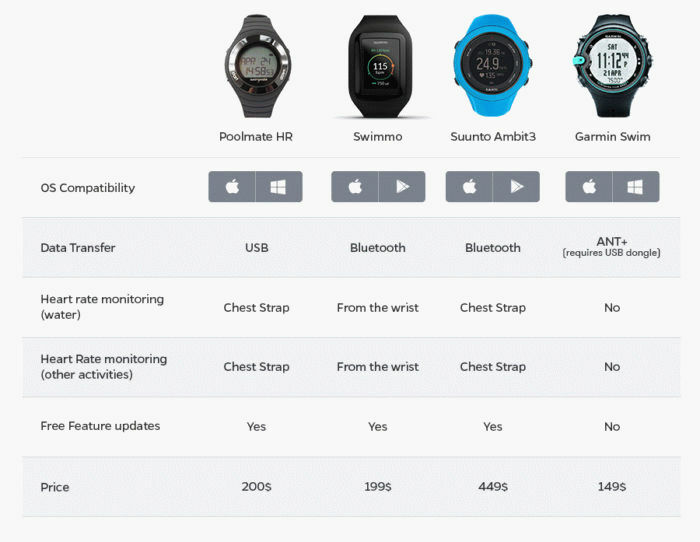 Suunto sports watches’ prices range from 299$ up to almost 1000$ and Ambit3 Sport is in the middle with 449$ (there’s a more affordable version but without swimming heart rate). Suunto is a multisport watch and as far as swimming features go you can use GPS to track open water training but it is done via a bulky nub on the bottom of the screen and Heart Rate – again is done via a wireless chest strap that is considered more accurate but very uncomfortable. The other problem with this method is that you won’t see live heart rate data as the chest strap will sync the data only when you’re outside of the pool. You also get typical data like length, laps, pace etc. But what I personally like the best are little graphs visible on the screen of the watch – not detailed enough to do the serious analysis but good for a quick glance at your progress. All and all – a good choice if you are ready to spend 500$ on a sports watch or 300$ if you can live without heart rate metrics. Garmin Swim is a well know swimming watch from an established company famous for their running watches and GPS trackers. 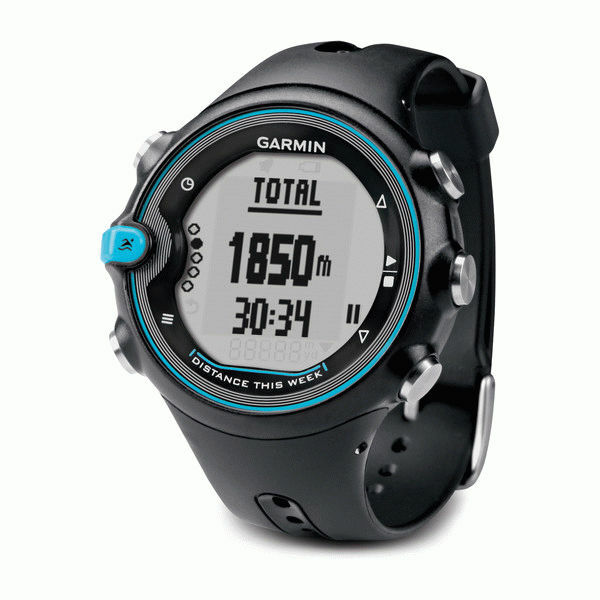 Garmin Swim is very simple in both form and function but thanks to that it only costs 149$. Garmin Swim can measure laps, pace, duration etc. as all swim watches do but additionally it can track your intervals and rests showing the duration and pause duration during the rest. The problem swimmers see immediately is the fact you configure that on the watch and this means some serious clicking on one of six Garmin Swim buttons – this part could be friendlier. The overall design will get you in a nostalgic mood as it throws you back to the days when owning an ‚electronic watch’ was a thing. The chromatic display7 does not help with that obviously and overall Garmin Swim design looks a bit dated. As for the data transfer, it requires you to use a USB dongle you connect to your computer then sync it with your computer and from there with Garmin Connect service. You can review some of the results after the workout on the watch but some calculations are done on the server so some things won’t show up until after the sync. Garmin Sync seems like a good watch to start your adventure with swimming but on the other hand, there are solutions not much expensive that can give you much more flexibility and some ease of use. We’ve also prepared a simple graphic comparing some basic features of all watches we’ve talked about. Hope this will make your choice easier!